When Creative Automation was contracted to engineer an electric motor assembly line for a major automotive manufacturer, they looked to IPR Robotics’ KA alignment device. They needed a device that would provide X-Y compliance while picking up a Power Distribution Module (PDM) for assembly onto the Motor. The KA’s role in this assembly line. When the robot picks up the PDM, the KA device floats in 2 axes, allowing the robot to find the PDM which is brought into the cell on a non-precision pallet. Once the gripper closes on the PDM the robot is able to lift it from the pallet then lock the KA device to a centered position. Next, the robot places the PDM on the motor with the KA device released, allowing the PDM to seat into the motor. At this point, the robot releases the PDM, and relocates to another pallet further downstream in the assembly process to remove the cover from the PDM. The KA is allowed to float again during this operation. Once the gripper is closed on the cover the KA device locks in the current, likely off-center, position. This allows the cover to be placed back on, upon return. The robot then takes the cover to a dispensing device where sealant is applied. After application of the sealer, the robot moves the cover back to the PDM and places it in the known position. 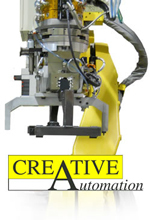 Creative Automation, Inc. (CAI), headquartered in Whitmore Lake, Michigan, provides turnkey automation solutions for industry. The company was formed in 1994 when founder Bernd Walter acquired the U.S. material handling division of SIG Automation. With an initial focus on SIG's gantries and pick and place designs, Creative Automation has since expanded its repertoire to include robots, vision systems, RFID and many other technologies. IPR Robotics, LLC is affiliated with IPR – Intelligente Peripherien fuer Roboter GmbH, located in Schwaigern, Germany, which has been in business since 1989. IPR’s global product offering includes a broad range of standard end-of-arm components including grippers, compliance wrists, alignment devices, tool changers, load limiters and force/torque sensors, along with 7th axis robot rails. IPR Robotics, LLC has been in the US since 2003 and excels at combining these components into complete EOAT solutions to meet the needs of each application. IPR provides the Hands and Feet of robots!